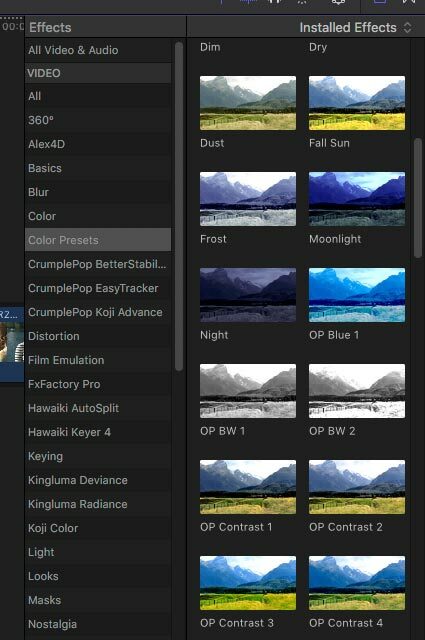 Apple’s Final Cut Pro X includes a deceptively simply – often confusing – yet extremely powerful color correction tool, commonly known as the Color Board. Custom grading “looks” are all the rage and FCP X includes a number of ways to stylize an image, including a selection of presets that can be applied in the Color Board. In addition, users can create and store their own presets, simply by saving a correction that they particularly like or want to re-use on other shots. When you save a preset, that creates a .cboard file, which is saved into the Color Presets folder located in the User / Movies / Final Cut Events folder. 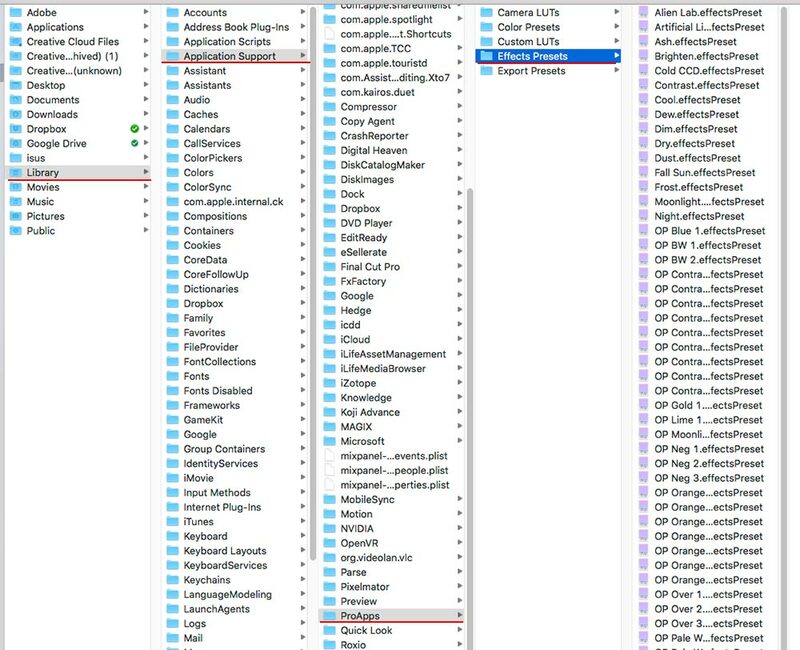 These files can be copied and pasted to other systems at that same location and thus become available for use within Final Cut Pro X on another machine. UPDATE: If you have upgraded to FCP X 10.1, this location has changed to the user Library, which by default is hidden. 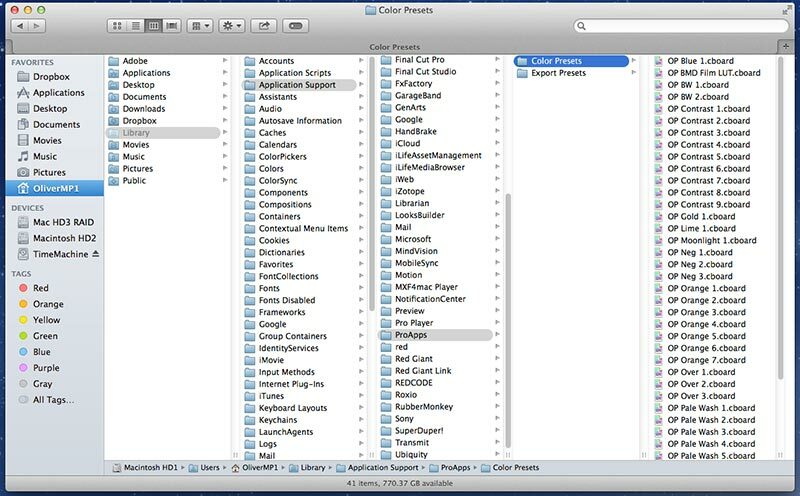 Hold down the Option key while selecting the Finder Go menu. This will expose the user Library. Now create or navigate to the Color Presets folder. User Library / Application Support / ProApps / Color Presets. So far in my limited testing, previously-created color board presets (.cboard) are compatible with 10.1. UPDATE for 10.4: Custom Color Effects presets are now located in the Effects Presets folder within the user Library of your Mac and not the Color Presets folder. Existing custom Color Board presets located in the Color Presets folder are supposed to be “promoted” to Effects Presets when you upgrade Final Cut Pro X to version 10.4. However, I have found that it worked correctly under macOS 10.12.x (Sierra), but not 10.13.x (High Sierra). 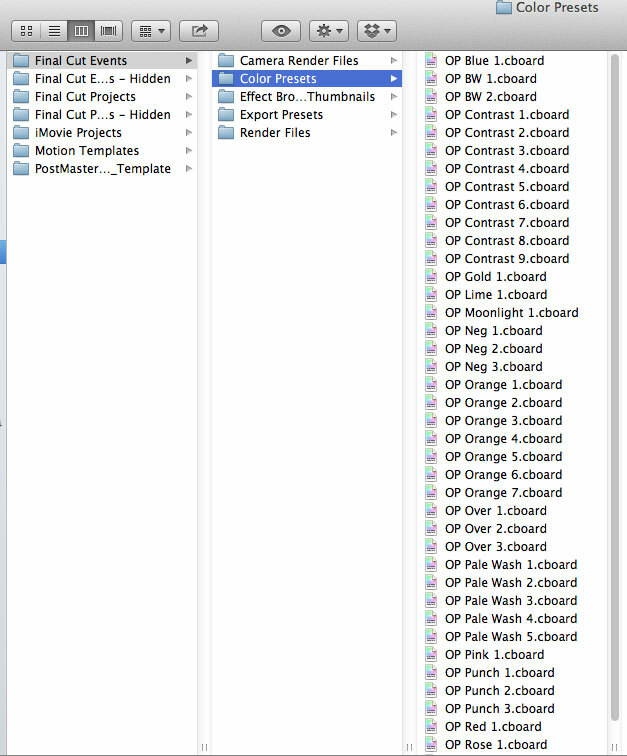 If you have previously downloaded and installed my Color Board presets and these did not get promoted to Effects Presets – or you have installed Final Cut Pro X 10.4 for the first time – simply copy the 40 OP presets from enclosed folder into your Effects Presets folder. You can access this folder by holding the Option key and then clicking on Go on your macOS top menu. This makes the user Library visible in the Go pulldown menu. The Effects Presets folder path is user Library/Application Support/ProApps/Effects Presets. Once correctly installed or promoted, these presets will appear in the FCPX interface’s Effects Browser in the Color Presets section. This will enable you to skim over the thumbnails to preview the look as it would appear when applied to your footage. These presets apply Color Board settings and can easily be adjusted through the Color Board controls, once you’ve applied them to a clip. I’ve created a set of simple, primary-grade presets that you can download and use if you like. These are based on the sample image of a woman that I have used in other posts. All you have to do to use these is download and install them and they will show up in the Color Board presets menu of your system. As with any software, proceed at your own risk, as I haven’t done any extensive testing. Once you install the presets and launch FCP X, the app may require a restart in order to update the Event. These presets are primary grades that were built upon the look of the sample image as a starting point. It’s fairly neutral, so if the tonal range of your clip differs widely, you’ll obviously have to tweak the sliders to get the look that’s appropriate to your footage. One suggestion is to apply the correction in stages. 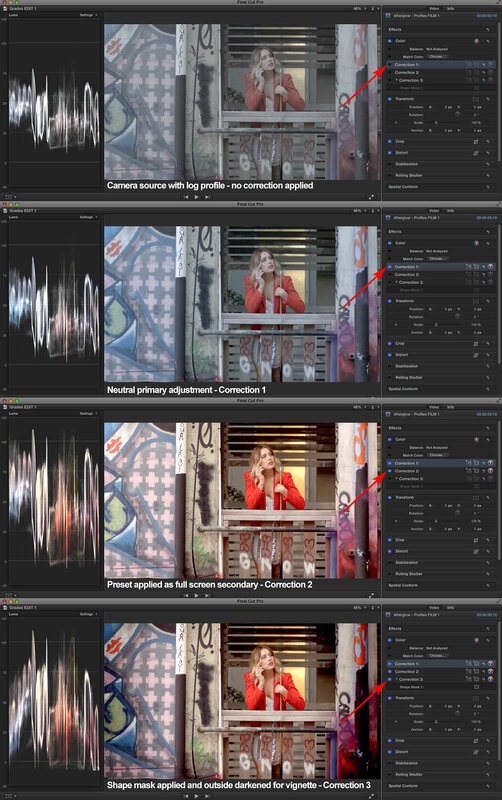 In this example, I have taken a log profile image from a Blackmagic Cinema Camera and applied three color correction settings (click the image to see an expanded view). The first is to correct for the log profile and get the image into a contrast and saturation range that is similar to my sample. On the next correction, I have applied one of my custom grades as a full screen secondary correction. Since none of these presets include shapes or color isolation, there is a third layer with a shape mask. I have used this to darken the exposure outside of the mask, thus creating a vignette effect. Click here to download a .zip archive file containing these presets. Click here to download a .zip archive file for Final Cut Pro X 10.4 or later. Click on any of these images for a slide show of the various presets. This entry was posted in color grading, Final Cut Pro X.